All American Scoreboards offers a complete line of scoring tables and accessories. Tables feature a custom-imprinted, illuminated, shatterproof sponsor panel. The durable welded aluminum frame with an innovative folding tabletop design allows for a narrow 12-inch storage width. Movement is easy with six heavy-duty locking caster wheels. Touch, 2-inch-thick vinyl padding provides complete player protection from all corners and edges. On the Model 2550-D indoor scoreboard from Nevco, bright red and orange LEDs are 13 inches high for time and scores, and other numerals are 9 inches high. For basketball, next possession and bonus indicator lights are standard features. Player number and personal fouls along with team fouls are also displayed. Lighted caption plates correspond to the sport being played. For wrestling, these captions change to read "match-weight-match." Captions are available for basketball/volleyball and for basketball/wrestling. The scoreboard comes equipped with an easy-to-install 2-Wire control system or a wireless control for convenience and flexibility. From Covermaster Inc., the CovermateTM gym floor cover handling system does the job of installing and removing a gym floor cover so well that it's one of the most widely used systems in North America. To install a floor cover section, you just walk it over from one end of the gym to the other. To remove it, attach the cover to its roller and simply wind it back up with the standard hand cranks or with an optional power winder. Sport Court, Inc. offers the new SportshieldTM Maple, providing the look of wood without the hassle. With the same coating as SportshieldTM —a touch-as-nails, factory-applied, polyurethane finish—these two products deliver some of the most durable, long-lasting performances on the market. SportshieldTM and SportshieldTM Maple can retrofit over most existing surfaces and require no adhesives, making them easier to maintain with a lower life-cycle cost than wood or many other synthetic flooring options. 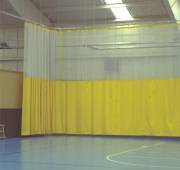 Douglas Sports Nets & Equipment offers a wide variety of high-quality products for indoor applications including custom netting, backdrop curtains, gym floor covers, gym dividers and protective padding. In addition, Douglas has manufactured high-quality sport nets and equipment for more than 30 years for indoor and outdoor sports such as tennis, volleyball, basketball, baseball, soccer and hockey. For the gym that's more than a gym, Sport Floors, Inc. has a gym floor that's more than a gym floor. Sport Floors, Inc. offers a complete line of synthetic sports surfaces specifically engineered for multipurpose recreational uses. Sport Floors installations have more than 30 years of proven durability, withstanding the war and tear of multipurpose activities, while delivering the athletic properties demanded by facility managers. First Team's FURY portable goal (pictured with an acrylic backboard) is just one of the options you'll find in its full-color catalog. A variety of backboard options are available on the FURY. In addition to portability, you also get easy height adjustment. A simple hand-crank mechanism allows you to lower the basket height from 10 feet to 6-1/2 feet. This is also useful for moving the goal into storage and executing drills for younger players during camps or youth programs. The FURY is an effective portable goal for schools, churches or residential use. Varsity Scoreboards is a factory-direct division of Sportable Scoreboards, one of America's largest and fastest-growing scoreboard manufacturers. Varsity Scoreboards are delivered directly from the factory to you, allowing you to receive greatly reduced prices. By cutting out the middleman, the company passes the entire scoreboard savings to you without sacrificing quality or service.